Serial Number: 436994CD. 24mm case size. Stainless steel case and bracelet. 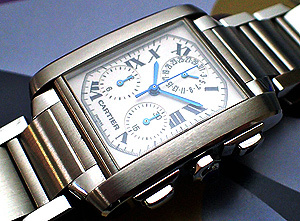 White dial with black Roman numerals and blue steel hands. Blue cabochon on crown. Date function. Sapphire crystal glass. Quartz movement. 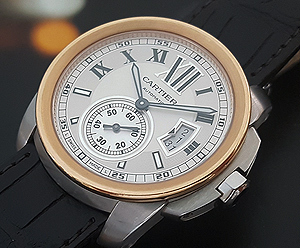 Watch comes with Cartier pouch. Overall Condition: 9.7/10: very fine. Serial Number: 781010CD. 36.5mm x 28mm case size. Silvered dial with sword-shaped hands in blued steel. Stainless steel case with 18K YG crown with blue cabochon. 18K yellow gold and stainless steel bracelet. Date function at 6 o′clock. Automatic movement. Water resistant to 30m. 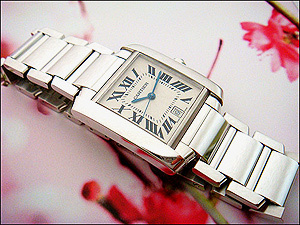 Watch comes with Cartier box and papers. Overall Condition: 9.9/10; extra fine. Serial Number: 3299. 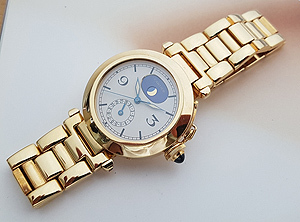 The outside bezel is 42mm but the case, at its widest point including the crown, is 47mm. Also from the top of the lug it is again 47mm. 18K rose gold and steel case. Brown alligator strap. Silver roman numeral dial with smooth bezel. Date function. Automatic movement. Water resistant to 30m. Serial number: 449560CE. 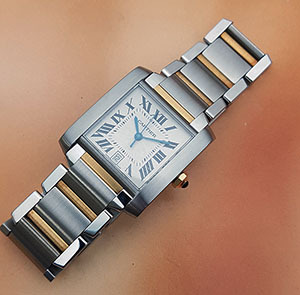 Stainless steel case and bracelet, case dimension: 20.5mm x 25mm. Black dial with white Roman numerals. Sapphire crystal glass. Blue sapphire cabochon on the crown. Quartz movement. This unique Tank Francaise in small size is a limited edition release made especially for the Asian market. 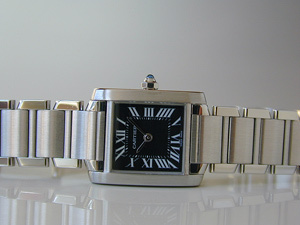 It features an elegant black dial to compliment the iconic Cartier Tank design. Overall condition: 9.7/10, very fine. 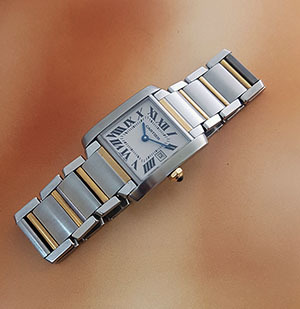 Tank Francaise 18K White Gold Ref. W50011S3. Case dimension: 28mm x 34mm. Solid 18K white gold case and bracelet. Guilloche dial. Sapphire crystal glass. Blue sapphire cabochon on the crown. Automatic movement with date function. Comes with insurance valuation certificate. Overall Condition: 9.9/10, like brand new. Serial 166445BB. Case dimensions: 37mm x 29mm. Stainless steel case and bracelet. Sapphire crystal glass. 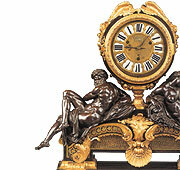 Ivory dial with Roman numerals and three subdials. Quartz chronoflex movement with chronograph function. Watch comes with insurance valuation. All images found on this site are copyrighted and are not to be reproduced without permission!